Larson's Italian dealer has recently introduced several new models ranging from open cruisers to smaller day-cruisers, particularly appreciated thanks to their versatile and sporty concept. The 215 Hampton (distributed on the Italian market by Four Wheeler Italiana) belong to this latter group, offering brilliant performances and captivating design together with a comfortable two-persons bow cabin. Sea trial was performed on a hot day, unfortunately cloudy, very close to the dealer's marina. The boat has performed extremely well: fitted with a 235 hp petrol engine with stern drives the remarkable speed of 50 knots was achieved with two persons on board and without compromising handling and riding comfort. The deck design include a practical passage to the bow area through a door built in the windshield assisted by two convenient moulded steps next to the steering station. The cockpit is fitted with pilot and co-pilot seat, a comfortable settee and a small sunbathing area. The boat is, however, very well equipped and is perfect for short coastal cruises. Molded depth: 1,50 mt aprox. 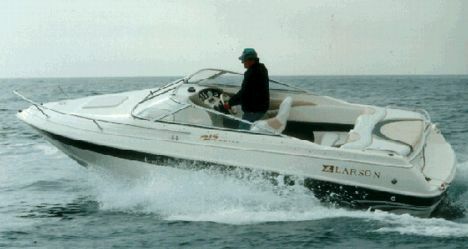 Standard equipment: the "Italian Package" include: two batteries, power steering, bow cabin with double bed, galley area with stove and sink, chemical toilet, courtesy and reading lights, hatch, several lockers, stereo system, compass, hours counter, depth sounder, windshield wiper, adjustable steering wheel, navigation lights, horn, swimming ladder, sun canvas, sunbathing area, cockpit carpets. Optional: electric windlass with anchor and chain, swimming platform shower, cockpit canvas, bow sunbathing cushion, stainless steel radar arch. Construction material and detailing: fiber reinforced plastic hull, built-in swimming platform, stainless steel bow handrail, convertible aft sunbathing area, stainless steel swimming ladder. Lockers number and place: three in the cockpit, several below deck. Deck: 5 stainless steel cleats, towing bracket, swimming ladder, large bow hatch, aft stainless steel handrail, upholstered cockpit sides, cups holder and charts holder. Interiors: white Plexiglas entrance sliding door. convertible double bed, galley area with sink and stove, chemical toilet, good headroom, nice and elegant upholstery. Steering comfort: the steering station is placed to the starboard side with ergonomic dashboard and soft-touch steering wheel, adjustable pilot seat and throttles.